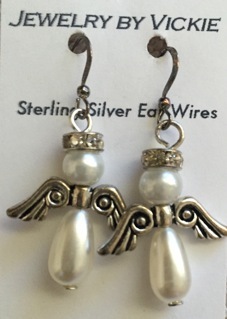 Angel earrings, with crystal crown, glass pearls, sterling silver ear wires, Tibetan silver wings. Approx. 1 inch long, from ear wires. Silver. The artist/designer, Vickie Jo Scott, is inspired by natural gemstones and the colors of nature. Her studies and many decades as a fine artist help her create unique jewelry designs, which include primarily 14 K gold-filled or 0.925 sterling silver, adding to the quality of the pieces. Be Inspired! Own one of these unique, quality creations made in the USA!